Apophyllite--Apophyllite can help the individual to charge the energy centers of the body and bring abundance of bright white light into the mind promoting joy and happiness, fighting depression. Apophyllite can be used to promote astral projection and protect you during the journey, allowing you to remember the lessons learned and the knowledge gathered during the out of body experience. This mineral aids the opening of the crown chakra to allow the universal energies to come into the body. Very powerful for deep, peaceful stillness and alpha state/meditation/dream recall, Clairvoyance, out of body travel, etc. Danburite---facilitates a connection with the Angelic realm, so you may communicate with your spirit guides. One of the highest vibrational stones, it activates the 3rd eye, crown, and etheric body chakras. It relieves emotional pain and stress, and opens and elevates the heart chakra. Green Quartz with Fuchsite—This extremely rare form of quartz facilitates the opening of the heart, lovingly transmuting negative energies to positive energies. Fuchsite further enhances the transfer of energy making it especially useful in understanding and practicing holistic and herbal healing. The use of this stone promotes physical and emotional well-being, creativity, success, and prosperity. Growth Interference Quartz---aligns the physical body with the subtle body. It can assist in removing blockages, both energetic and physical, and helps access the higher, etheric planes. It is protective, stimulating foresight and healing. Himalayan Quartz--- holds sacred energy frequencies and the wisdom of ancient cultures. The crystal can be used to enhance, amplify, and intensify transformation, releasing self-limitation, disease and disorders. Himalayan Quartz Crystals gather, hold and release a very high energy with a powerful "ohm" vibration. 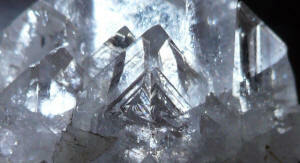 It is also an enhancer and activator of other crystals. It is believed that they have the ability to receive and transmit energy from both ends and are used for alignment, patience, perseverance, protection, dreams and astral projection. Double terminated crystals strengthen energy flow, and create an energy vortex that can clear all unwanted energy, changing negative into positive energy. Lemurian Seed Crystals---are said to have been placed here by the ancient Lemurians. It is believed that they were programmed to transmit frequencies to other crystals that were forming in the earth, and offer a connection to the many sacred places located upon and under the earth's surface. They create a holographic connection between the inner earth, the earth's surface, and the stellar regions. Only one Lemurian Seed Crystal is required to connect to all the other seed crystals. They enhance astral travel and communication with Spirit Guides. These crystals are excellent to use in healing energy work for the removal of strong blockages. They clear and balance chakras, and assist in dream-work. Phantom Quartz—an excellent stone to aid the Earth in the cleansing and healing of Herself. The phantoms within are a pictorial account of the experiences the crystal has encountered and often record the experiences of primal Earth, Herself. Within Tibetan quartz, I have seen mountains, waterfalls, and palm trees, depicting a time of tropical climate. Birds are often seen “flying” through the crystal. As children of Mother Earth, we can also use this quartz to access past lives in a detached and transcendent atmosphere, healing the emotions and negative patterns which have become attached to those lives. This stone also facilitates meeting one’s spirit guides. Rutilated Quartz---, the "problem solver" crystal, assists in getting to the root or heart of a problem. It affects the etheric and astral bodies, enhancing astral travel and connections to other realms. Scepter Crystals----These crystals were used in Atlantis and Lemuria in healing ceremonies and were a symbol of the power of the realm - the high priest/priestess. Scepter crystals are among the most powerful and versatile, and can be used to focus energy as well as dispel negative thought-forms. Excellent for amplification, storage, transfer, and transformation of energy. They can be used to clear, heal, to attract, and to protect. Singing Quartz—singing the transcendental “ohm” vibration, these crystals assist in interstellar communication with celestial beings. These crystals harmonize Star songs with the healing Earth songs and joyfully help release energy blockages to sooth and align the aura. Spirit Quartz---provides protection from mental and physical harm. It enhances harmony and peace in groups, and assists in processing grief. It facilitates the healing of disorder and disease, transforming negative to positive energy. Spirit Quartz elevates one's sense of self-worth and relieves difficult memories. Assists in visioning, meditation, and connecting to one's Higher Self. Smoky Quartz—root chakra--dispels negativity, is grounding and protective. It enhances dream awareness and channeling abilities—good for meditation. This stone balances mind and body, easing depression and promoting peace of mind. Tourmalated Quartz---is excellent for providing a bridge between spirit and matter, helping to bring balance and protection. The crystal actualizes strength in relationships and situations. It aids in eliminating destructive patterns and and adjusts imbalances.